When I opened my front door this afternoon I saw a eighteen-ish dude in a plaid shirt, long denim shorts and a curiously feminine silver bracelet on his right wrist. His backpack was thrown over his left shoulder hoisted in place by his left hand. Blond facial hair covered his red face. Definitely not from around here, definitely trying to sell me something. As I started to give my firm-yet-apologetic "I'm really not interested . . ." I was stopped by a very firm prompting. Buy whatever he is selling. This caused me alarm. As a personal guildline I shoo solicitors away without any introduction. Just yesterday I waved off a guy selling coupon books (useless) for some cause just as I was trying to pour pancake batter for an army of nieces and nephews. In my white terry cloth robe no less. I hate making pancakes almost as much as I hate solicitations I decided. "I am here in the neighborhood to sell this powerful cleaning agent . . . strawberry . . . licorice . . . blood." And on when the schpeel until I interrupted. "How much for one bottle?" "That would be 49.02 M'am." But fifty bucks? I wondered in my head. For fifty bucks I could buy a new . . .
"I will take one bottle." I heard myself say. As I ran to get my checkbook (solicitors, pouring pancakes, writing checks, I am starting to see a pattern here) the thought occurred that I should probably share the gospel with my traveling salesman. I mean, that was the best explanation for the whole "inspired" expenditure. "So," I started out awkwardly as I wrote out the check. "I bet they told you there would be a lot of Mormons in Utah." Where was I going to go with this? "Yeah." He said. "I am from the Bay Area and I wanted to come out and earn money for college." "Well, you are lucky to be selling around here. I . . . mean . . . us Mormons sure like to . . . have clean . . . houses." "Yeah." He said again. "My boss told me." "Okay, so . . ." I stopped. Should I keep going with the whole intro to Mormonism or . . .? "Here is your check." "And here is your Pro-Tek Cleaner. This flier tells you all about the money back guarantee." He handed me a crumpled flier with blue printed lettering, re-hoisted his backpack, and jetted off down the street. I felt confused. Should I have offered a trade? Two bottles for me, if a Book of Mormon for him? Did I even have a Book of Mormon to give away? 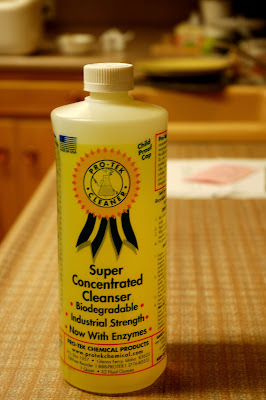 An hour later Page stopped by Retro House for a visit and saw my pricey cleaning agent on the countertop. "Pro-Tek Cleaner! I love this stuff. You rarely have to scrub anything, it's that good!" She exclaimed. After I told her the story of how I came to be an owner of such a product. I added the part about me trying to share the gospel. "Really? That was the best you could do?" Page asked. I've never been a natural at missionary work, even when I was a full-time missionary. I haven't really located my insecurities because I know the gospel is true. Maybe it boils down to the fact that I don't have many serious discussions in my life. Maybe it is time I tried on maturity for size. Tomorrow, maybe, I'll get working on that. Later this evening as Chup and I took The Chief for a drive I confessed my whole story. "And then . . . I bought the bottle . . ."
"Well . . . he did say it would last us a year . . ."
"I was really was really trying to share the gospel. Even though . . ."
"You wrote the check for . . .?" But our conversation was cut short. From the recesses of our backseat--inside that little bundle of a carseat--came a large grunt. Then a bubbly release of gas. Grunt. Release. Grunt. Release. The Chief was working so hard, bless his heart, to move his darling newborn bowels. Chup and I were laughing (because it was really funny) but silently, as we didn't want The Chief to understand the social implications of his public display of gastric distress at such a tender age. We are such thoughtful parents. When we arrived home we discovered The Chief covered in mustard poopage. We found it in his hair, between his toes and inside his ears. Our son had literally exploded. He spared no expense in dousing the carseat either. Every fold, clasp and clicky-thing was smothered. There was seepage into the padding. I almost called Utah Disaster Kleenup. "Do you want to work on him or the carseat?" I offered Chup his choice. "Him." He said holding The Chief at arms length while rushing to the nursery. As I sat down to scrub the carseat, all alone in the kitchen, I wondered how I was going to salvage and restore our beloved carrier. I was feeling too energy-deficient to scrub and there was no special trick to make it all go away. Then, out of the corner of my eye I saw the Pro-Tek Cleaner on the countertop. How convenient that I bought this bottle just this very day . . . wait a minute . . . Unexpectedly I stopped feeling bad for my lack of sharing the gospel skills. I am so taken care of.